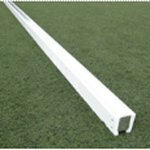 Modelled on the FIH requirements, this goal features a heavy-duty aluminium extrusion that will never rust or stain synthetic fields but yet tough enough to withstand the impact from ball hits from top level players. Profiled aluminium backboards with polyurethane poured on the inside for correct ball rebound. No more rotting plywood backboards. In-profile net attachment along the uprights, crossbars, and clamped attachment on the backboards so balls cannot escape. 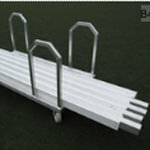 Supplied with heavy duty braided nets and heavy duty rear wheels. Still light enough so one person can move on their wheels. Clubs and players, we have listened to you and this is the result. 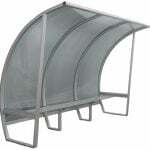 Hi Tech Sports has a complete range of nets, corner flags and post padding for hockey and all other sports. 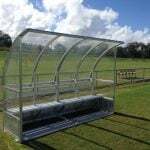 Player shelters are available in various sizes and options. Manufactured from high quality aluminium, the shelters are finished with a durable transparent Lexan polymer, and with your choice of timber, or long life aluminium seats. HiTech Sports has a complete range of scoreboards for hockey and all other sports. Scoreboards can be customised to include team names or sponsors details, and even designed to display the information you need. 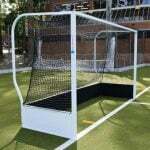 HOCNET Heavy duty nets to suit international goals. HOCIDT Trolley to suit. Steel powdercoated construction. Holds approx 30 lengths/60lm. FLGS Sleeved flag. 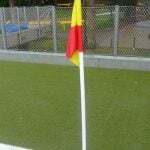 Articulated Safety post with vinyl flag – set of 4. PSAL-T Player shelters. Option for grey tint.